I happened to travel to Hamburg for a friend’s wedding and couldn’t resist taking a first glance at the city’s new landmark. 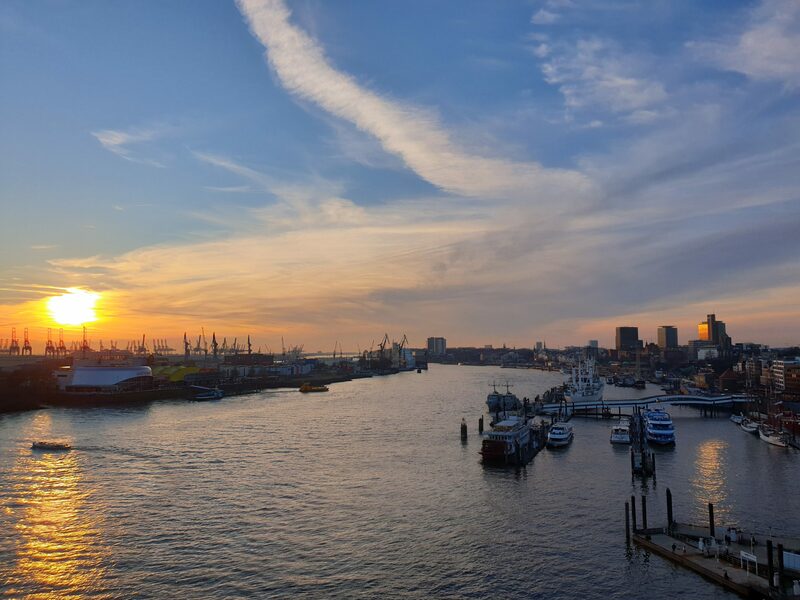 The spectacular Elbphilharmonie drew my attention from the moment I got out of my car at the St. Pauli landing bridges. I had heard so much about it, from its construction Odyssey to the memorable opening ceremony in January 2017. But I was not really informed as to what to expect exactly. So, even if there were no concert or at least guided tour tickets available at such short notice, I was going to check it out and get a first impression of it. I found it very exciting to see a prestigious project that had been all over the media in the past few years in person. I felt my curiosity arising the more I approached it. 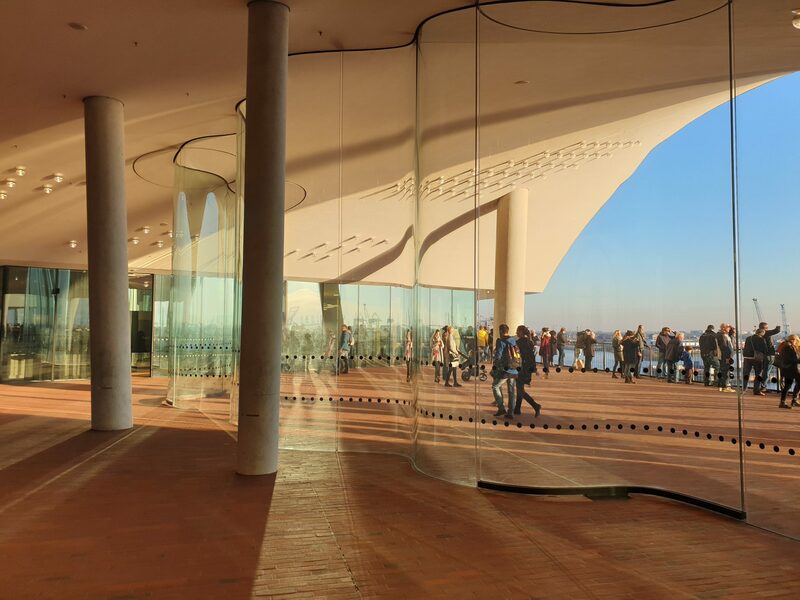 The first sight was already very promising: a monument of modern architecture, with a brick-covered base, typical for North German architecture, and a glass top in the shape of a ship sail, reflecting the sunrays of the luminous day. I looked out for the viewing platform mentioned by a colleague as “a must-see” for visitors, presuming it would be on the roof of the building. But seeing its totally uneven structure from afar, I couldn’t imagine any kind of observation deck on top of it. My colleague had also said that visitors needed to reserve tickets in advance to enter the so-called Plaza. I hadn’t done so, but I decided to try my luck after having taken a closer look from the outside. 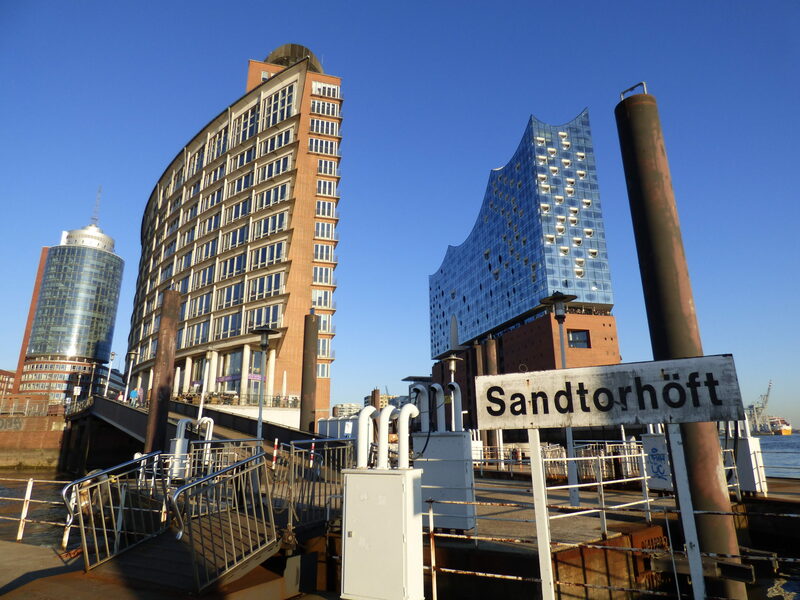 And there I was, standing at the Sandtorhöft, a dock from where I had a wonderful view of the Elbphilharmonie’s peak. I had discovered the perfect “picture spot”. The building seemed very narrow from this angle, and I found it hard to imagine that there is a concert hall fitting 2.100 people inside it. I finally spotted the observation platform that goes all around, offering breathtaking views on the city and its huge harbor. The name, “Plaza”, had made me think of a square rather than a circuit. But, as it turned out, it was not on top, but a little less than at half height, between the edifice’s brick-covered foundation and underneath its upper, glass-structured part. Seeing many people enjoying the view from up there, I also wanted to make this experience and headed towards the actual entrance where I, fortunately, had no problem at all getting a free entrance ticket. I felt quite excited when I took the moving stairway towards the inside of the building I had so much admired from the outside. I didn’t yet know that this 82m long escalator called ” Tube” is the longest curved one in the world and that it leads to a large panoramic window. 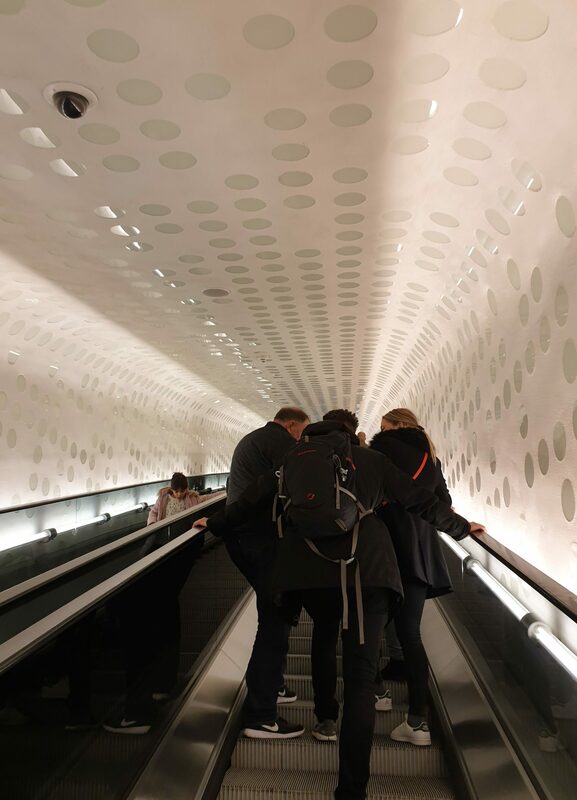 My journey into the Elbphilharmonie felt highly promising already. A few more flat steps later I was standing in the middle of the light-flooded Plaza, the central platform of the building, a meeting point for concert visitors and general tourists alike. I could see a wooden staircase to each side, one leading to the big concert hall and one to a smaller venue, meant for chamber music concerts. A row of wave-shaped windows on both sides offered beautiful views, playful photo possibilities, and invited me to take one of the exits to the panoramic circuit. Stepping outside, I was at first amazed by the stunning views all around. But after taking a dozen pictures in all directions, I started realizing how packed the platform was. It felt as if I was taking part in a mass event. 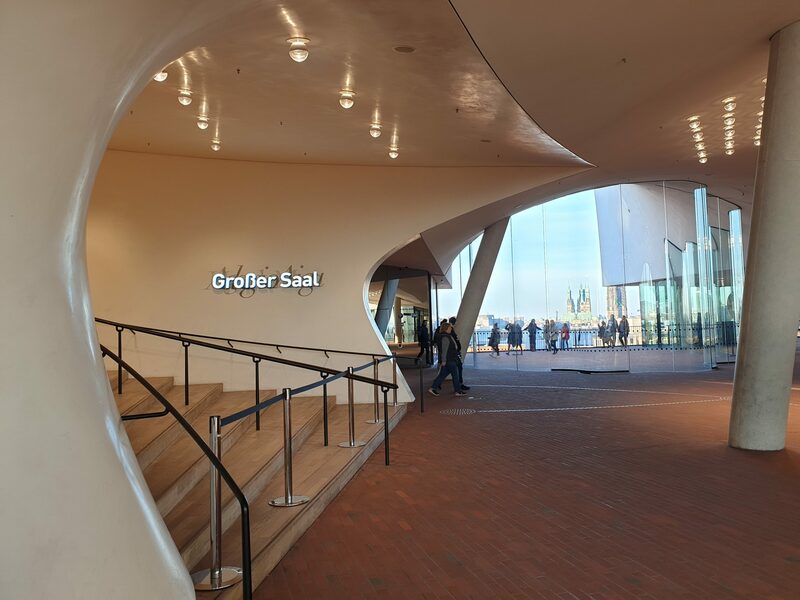 I began wondering how many of the Plaza’s visitors knew they were actually visiting a big venue of mostly classical concerts, which also houses the NDR Elbphilharmonie Orchestra (the former Northwest German Broadcasting orchestra). I couldn’t help but think that the majority of visitors were unaware of these connections. They had probably just come to cross off one of the city’s top-ten sight-seeing spots from their bucket list. 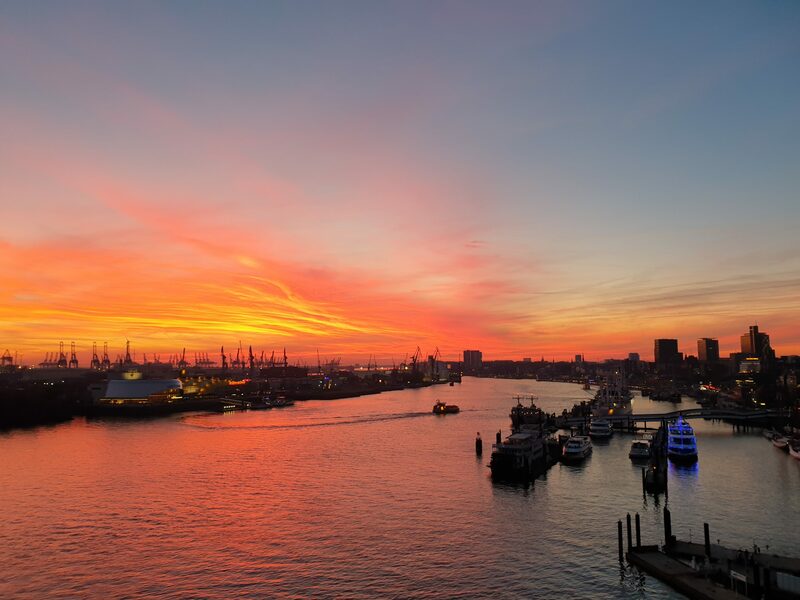 Next on the list, also in conviniently close proximity, right across the harbor, would most likely be a visit of one of the big-scale musical productions in specifically build auditoriums Hamburg is also famous for. 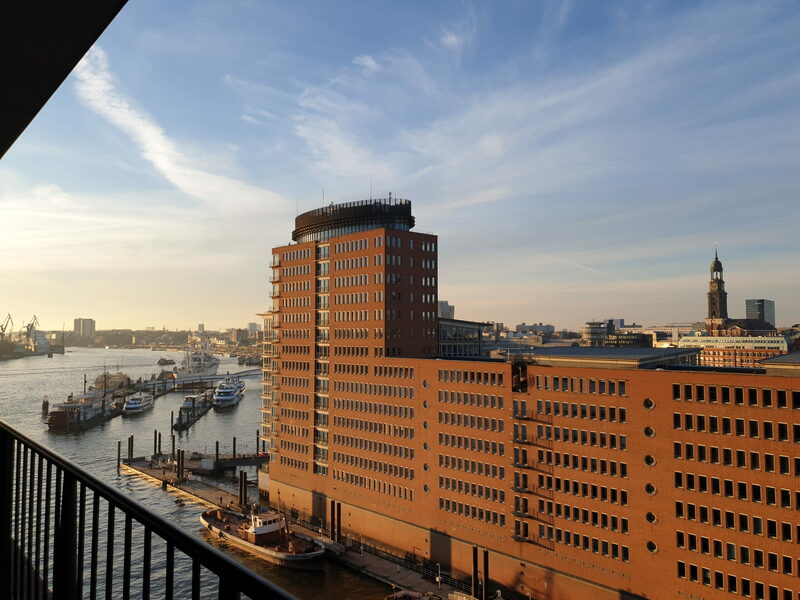 Only now did I notice the 5-star-hotel incorporated in the building and learned that the Elbphilharmonie also contains residential apartments. I found out that the included restaurant is a kind of beer pub, offering beer-tastings, and that the café adopts a very casual, take-away and coffee-to-go style. I must admit, I asked myself if all this is necessary nowadays. Aren’t world-renowned orchestras and famous soloists alluring enough to sustain such a building and fill it with people? Is the brand-new, eye-catching concert hall with its sophisticated acoustics not sensational enough? 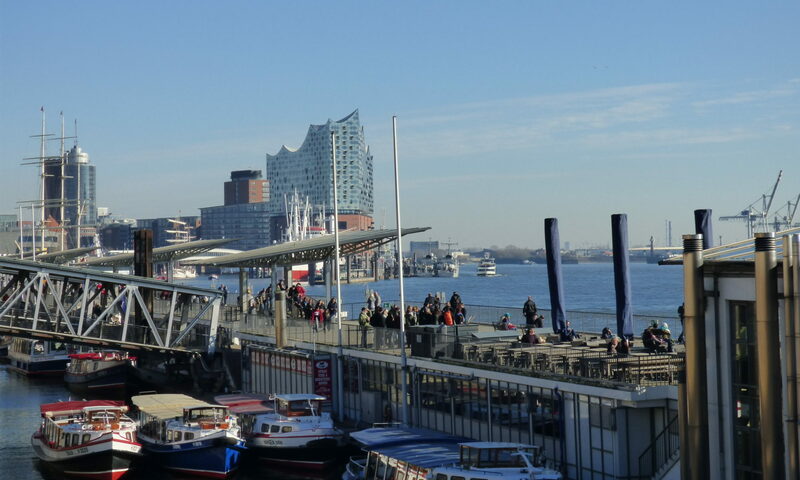 And if not, why is the edifice called Elbphilharmonie and not something else? Or is the concert hall just part of an event location, and not even the most significant? 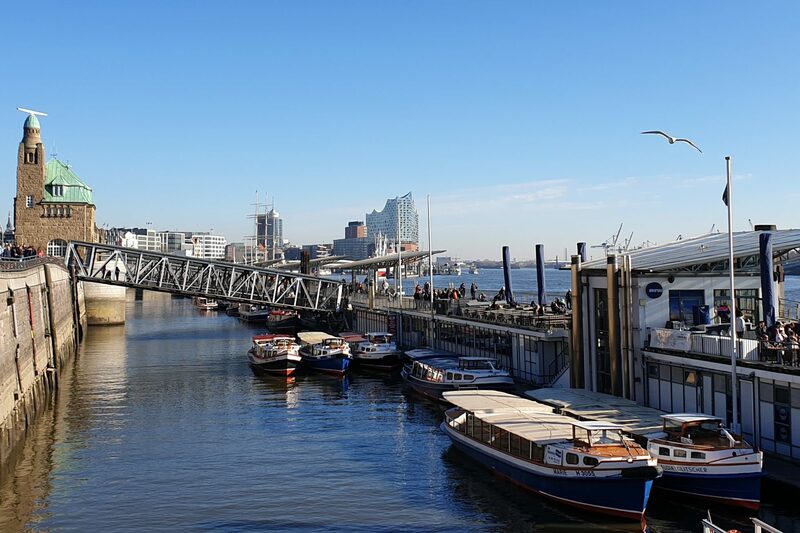 The Elbphilharmonie – A Total Work Of Art? 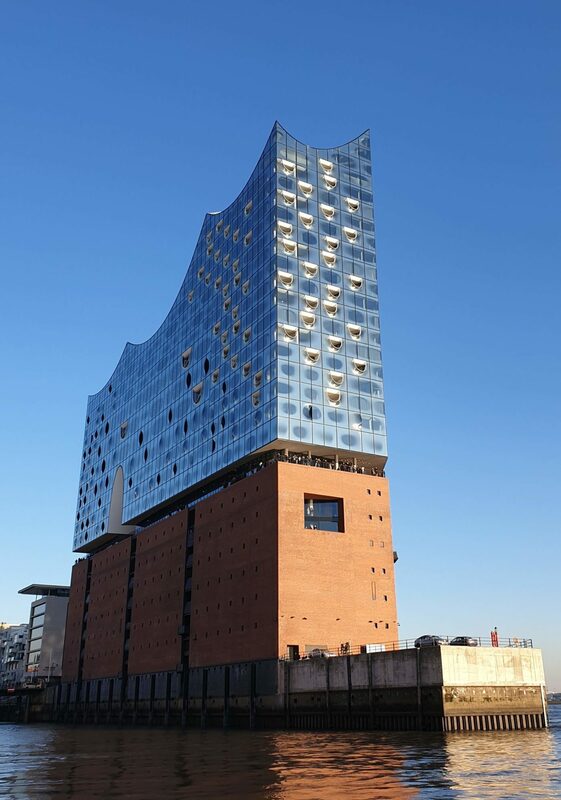 Some research I did since my visit has taught me that the Elbphilharmonie is a “spectacular Gesamtkunstwerk” and “more than a concert house”. Its foundation, a former quayside warehouse, of which only the walls were kept during reconstruction, houses three music studios. They offer many educational and participatory programmes, as well as space for experimental music, seminars, workshops, and rehearsals. 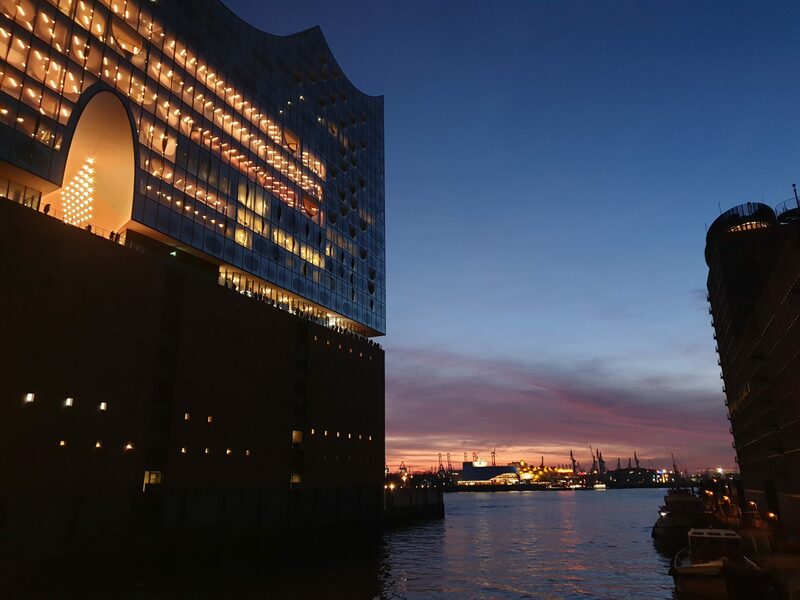 The makers of the building call the Elbphilharmonie a total work of art, which combines innovative architecture with an exceptional location, outstanding acoustics, and a visionary concert programme. It is designed as a democratic edifice, with a public plaza as a space for everyone. This might all be true. But the modern architectural and sociological approach leaves me with a lot of unanswered questions, especially when it comes to the unique feature of an extraordinary new concert hall. I guess I will have to come back to see how I feel about it at a second glance. And maybe I’ll then get the chance to attend a concert or even actively participate in one as a singer, thus feeling the heart-beat of this remarkable building. On a grey afternoon whilst in Berlin, I decided spontaneously to walk in the Amerika House, now an exhibition space for the C|O Berlin foundation near the Zoologischer Garten station. It is my first visit here, but surely not my last. I started with the ground floor, „Back to the Future. 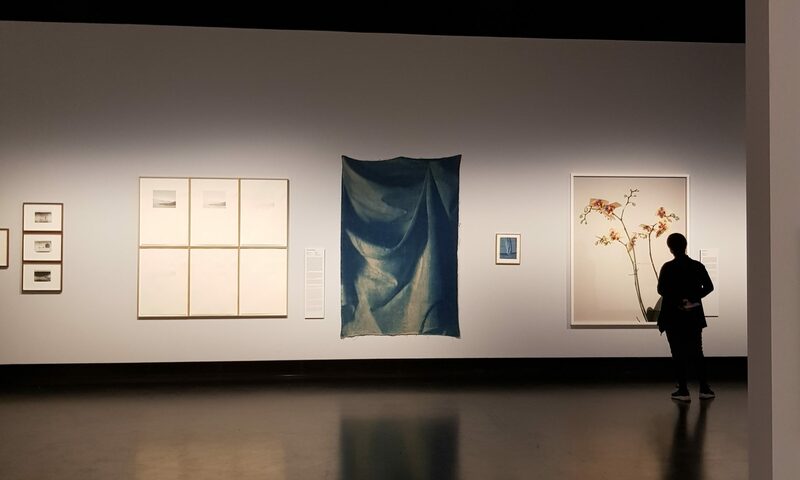 The 19th Century in the 21st Century.“: an exhibition about the beginnings of photography and its experiments with exposure, chemical reactions in connection with nature, natural elements and its continued fascination on actual artists. Whether it is Anna Atkins‘ influence or Warren de la Rue’s, it is quite extraordinary how nature, flora, light, earth, moon keeps on fascinating. I enjoyed taking the time to read the information panels. The contents are most interesting and the texts are set discretely, with a nice sized print. The second show was totally different: a retrospective show of Nicholas Nixon’s work. Nicholas Nixon is an American photographer known in parts for his series of the Brown sisters. A series of portraits of the 4 sisters, one of which is his wife. They are always posing in the same order, but not in the same way. Nixon photographed them once a year for 42 years. The retrospective, however, starts with his beginnings, the „New Topographics“ series, the „City Views“ series and later goes on to other most moving portraits series. I have to say this show left me very moved. His constant search for closeness in his portraits whether in his series „couples“, „aids“ or „elderly“ was almost too much for me. By saying this, I mean it touched a nerve in me, which I don’t always have the strength to have opened. The distance I needed was not there, but that confrontation is what Richard Nixon wanted. In a short video at the end of the show, he explains this clearly. I can strongly recommend theses exhibitions, they are moving and strong. Congratulations to the C|O Berlin foundation and the curators. I came out feeling inspired and emotionally taken in, and that is not always the case.